November 24 2009 - The Federal Aviation Administration is proposing a rule requiring scheduled airlines to either retrofit their existing fleet with ice-detection equipment or make sure the ice protection system activates at the proper time. For aircraft with an ice-detection system, the FAA proposes that the system alert the crew each time they should activate the ice protection system. The system would either turn on automatically or pilots would manually activate it. The FAA estimates the rule would cost operators about $5.5 million to implement. Operators would have two years after the final rule is effective to make these changes. The proposed rule would apply only to in-service aircraft with a takeoff weight less than 60,000 pounds, because most larger airplanes already have equipment that meets the requirements. In addition, studies show that smaller planes are more susceptible to problems caused by undetected icing or late activation of the ice protection system. The rule technically affects 1,866 airplanes, but all turbojet airliners and many turboprops covered under the rule already have equipment that satisfies the requirements, and the FAA believes others will be retired before the projected compliance date in 2012. In August 2009, the FAA changed its certification standards for new transport category airplane designs to require either the automatic activation of ice protection systems or a method to tell pilots when they should be activated. Since 1994, the FAA has issued more than 100 airworthiness directives to address icing safety issues on more than 50 specific aircraft types. These orders cover safety issues ranging from crew operating procedures in the icing environment to direct design changes. We also have changed airplane flight manuals and other operating documents to address icing safety, and issued bulletins and alerts to operators emphasizing icing safety issues. Temperature: In some cases, airframe manufacturers have specified definitions of icing conditions for some airplane types. In the absence of type- specific information, the IPHWG concluded that conditions conducive to airframe icing would exist in flight at an outside air temperature at or below 2 [deg]C in clouds or precipitation. Engine IPSs are commonly operated at or below a static air temperature of 5 [deg]C or a total air temperature of 10 [deg]C. This temperature is different from the 2 [deg]C recommended by ARAC for this proposal. The FAA believes that using a common temperature for activation of both the engine and the airframe IPSs would reduce crew workload and decrease the probability of the flightcrew not noticing when the temperature has dropped to 2 [deg]C.
The FAA therefore proposes to identify conditions conducive to airframe icing in this proposed rule as visible moisture at or below a static air temperature of 5 [deg]C or a total air temperature of 10 [deg]C.
The FAA agrees with the IPHWG that flightcrews must be given a clear means to know when to activate the airframe IPS. In the past, many airplanes have had procedures requiring activation only after a substantial accumulation of ice. This proposed rule would require that ice detection systems be installed, or that ice protection systems be manually activated in conditions conducive to icing in most phases of flight. 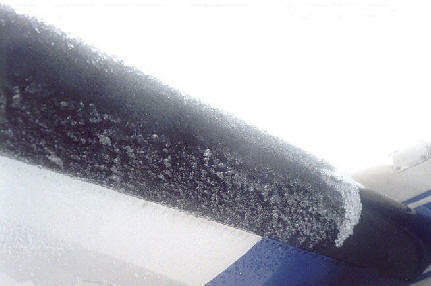 In the cruise phase, the airframe IPS would be activated at the first sign of ice accumulation anywhere on the airplane. To ensure timely activation of the airframe IPS, the FAA proposes to amend the current part 121 regulations as recommended by the IPHWG, except for the change to the temperature considered conducive to airframe icing, as discussed above. Compliance Time: This notice proposes a two-year compliance time after the effective date of the final rule. That compliance time is based on the time required to approve new designs and install new equipment. For some airplanes, it may be possible to comply through AFM revisions alone, which could be accomplished quickly. However, some airplanes may need to go through a more involved certification process, so the longer compliance time of two years was chosen.